Sometimes after a long day in the office humor can be the best medicine. 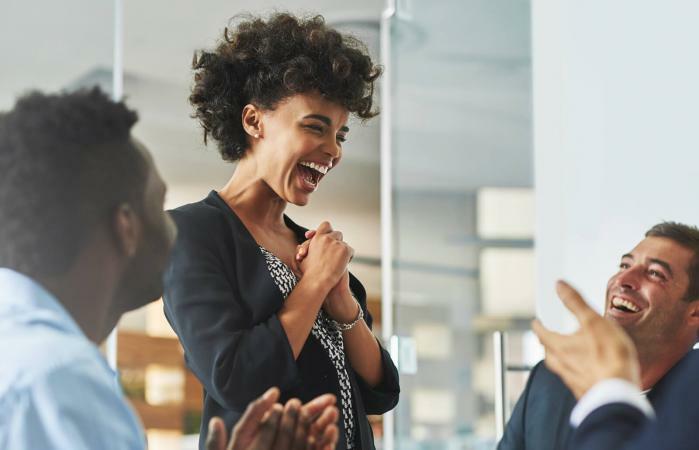 Business jokes can really be a great way to brighten the day for your coworkers or to help yourself de-stress. If you like telling jokes rather than coming up with them on your own, you're sure to love reading (or repeating!) these highly rated jokes about business. "How many marketers does it take to screw in a light bulb? None - they've automated it!" Maybe you need to have a chat at the water cooler, or you just want to add a little fun to your day. This classic joke received high marks from The Very Best Office Jokes. "How is Christmas like your job? You do all the work and the fat guy in the suit gets all the credit!" Boss/worker jokes are always funny. This is even more true when you add cash to the mix. That's why Alberta Venture includes this tale as one of its top "office-approved" jokes. Finding clean jokes for your office pleasure can be a bit difficult. However, there are several top clean jokes out there. "Tom had this problem of getting up late in the morning and was always late for work. His boss was mad at him and threatened to fire him if he didn't do something about it. So Tom went to his doctor who gave him a pill and told him to take it before he went to bed. Tom slept well, and in fact, beat the alarm in the morning. He had a leisurely breakfast and drove cheerfully to work. One-liners are a classic in a business setting. Therefore, finding a jewel like this listed on several top sites, including Reader's Digest, isn't surprising. Q: "Why did the can crusher quit his job? A: Because it was soda pressing." Puns add fun to life. Therefore, it is not shocking that this pun made its way to several favorite lists. "I used to be a banker but I lost interest." While business loans aren't generally funny, this top business joke from OnDeck will make you chuckle. "Henry was on his morning walk when he bumped into his friend Paul. Business jokes aren't just for adults. You can have some funnies that will tickle a kid's funny bone like this joke from Lemonade Day. "When the CEO dropped a brownie on his calculator, he was accused of fudging the numbers." What Is the Best Selling Soda?